Leave your comments below if you have any questions regarding the template or contact me via form. The template downloaded before this update date comes with header with no IMAGE support. Thanks to Whisper for the information on that. 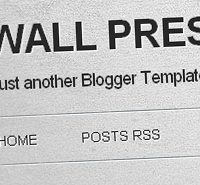 I've updated the template downloads with HEADER IMAGE support. For those who downloaded and using the template, you have to change a small piece of code with another. Go to Design > Edit HTML > Click on "Expand Widget Templates". Search for the following code using CTRL + F.
Just above that code, you'll see these codes. Replace those codes with the code below and click Save.